I love the 60s vibe to Marc Jacobs SS13 show at New York Fashion Week. 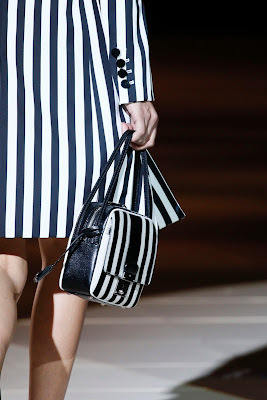 Black and white, stripes, sequins, boxy handbags and chic harlequins. It's bold, but extremely wearable. For those of us who spent last Summer keeping our midriffs toned and tanned for the bandeau/pencil skirt combination, it's time to head back to the gym and work twice as hard as the belly button is now the main feature. Makeup wise, strong brows are still a feature (and how could they not be, when the breathtaking Cara Delvigne wears them so well). The classic 60s eye has been given an update in chocolate, with a smudgy effect that is both wearable and achievable for off runway makeup.